A short post today, so I can get back to my miserably teething, feverish baby and my nudist 6 year old. I felt like making banana bread this morning as an Easter treat, and improvised this recipe to use up some super-ripe plantains. You would never be able to tell that the resulting loaf is grain-free or barely sweetened: it is moist, has a crumb that holds together better than gluten-free varieties I’ve tasted, and takes just minutes to make the batter. Nolan likes it so well that he just tried to walk off with the entire loaf rather than wait for me to cut him a slice. Enjoy! Preheat oven to 350F. Place all ingredients through vanilla in a food processor and blend until smooth. 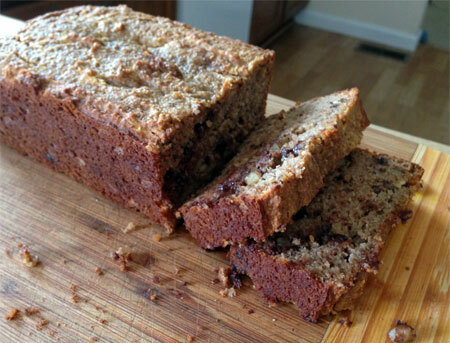 Stir in walnuts and chocolate chips by hand, and pour batter into a 9×5 loaf pan greased with coconut oil. Bake for 1 hr or until a knife inserted comes out clean. Source: Freely adapted from Ditch the Wheat.